A few days ago, I informed a group of five #Meliora students that their history project had advanced to Illinois History Day, the last step in their quest to become contestants at National History Day. I see these students face-to-face one day a week; the rest of the time they work individually and in a virtual environment using collaborative tools such as G Suite for Education and Trello. I informed them by email of their victory, expecting some kind of happy dance response. And received silence. The next day, my phone rang. “Um, Miz J, we have been working on updating our project narrative. Can you look at it and give us feedback?” They had arranged a face-to-face meeting among themselves and gone to work. This is a fine example of #intrinsic motivation, and an outcome commonly seen in #PBL (project-based learning). As I describe here, engagement was maximized by giving students #voice and #choice over their project topic, and also over the format they used to develop their product. They have been working on this project (along with other things) this whole semester. This long exploration exemplifies “sustained inquiry,” an integral element of Gold Standard PBL, as defined by PBLworks. Multiple factors have sustained the students’ interest. Initially, they were intrigued to find out more about the subject of their project, Colleen Moore. They researched using books, clips of her silent movies, online archives, databases, etc. Once they wearied of these forms of investigation, they experienced a fresh spark when they interviewed Ms Moore’s grandson. His descriptions of her, and other connections he pointed them to, renewed their enthusiasm for digging deeper into evidence of her life and influence. Another important factor in the students’ continued enthusiasm is the public audience, another tenet of Gold Standard PBL. At each level of competition, they present their project before a panel of judges. Invariably, the judges express interest in their work and in their process. The judges also provide the students with specific suggestions on how to improve their work. This encouragement and critique from the outside audience spurs the students on to create yet another #iteration of their project (also integral to Gold Standard PBL). The stakes are also higher at each level of the history fair competition, which intensifies both the focus and the stress. The challenge is to ensure the students are experiencing an appropriate level of stress. As this Psychology Today article states, “You experience good stress when you feel a sense of control over the event in question. No matter how your body may respond in the moment, you know you’re going to come out fine on the other side—and perhaps even better for the experience.” My observation is this group of students is functioning within this range. Their ultimate goal is to advance to the national level of competition. At the same time, they are staying grounded, taking one step at a time, to each subsequent level of competition. The current iteration of their project may be viewed here. Earlier this week, a group of five #Meliora students finished revising their National History Day (NHD) documentary project in preparation for the next level of competition. NHD projects essentially consist of developing and defending a thesis, a difficult cognitive task for the middle- and high-school students who enter this contest each year. At each level of competition, the students present their project before a panel of judges, who evaluate and provide feedback on the solidity of their thesis argument. Those projects with the most persuasive defense are the ones which advance to the next level. In the recent competition, my students received feedback that their selection of secondary sources was narrow and limited. The judges knew this because as part of the NHD framework students are required to create an annotated bibliography of their sources. As I supported them in learning how to more effectively dig through (online) newspaper and other archives, one of the students commented, “we don’t need this article, because we already have this information.” Which prompted me to loop back to earlier in the year, when we discussed reliability of evidence, how we must find multiple sources that support facts or a certain interpretation in order to consider it reliable. We work on #digitalliteracy as we talk about the kinds of digital sources that are generally more reliable, with the understanding that even those must be substantiated. During the revision process, the students also made some claims I was skeptical of as they developed their historical context. So, I did a little research of my own and presented my evidence, which clashed with their claims. Then I asked them to sort out what they thought the most valid interpretation was. This experience coincided with my reading of a recent MindShift article on how students are unable to evaluate the credibility of what they read online. The percentages are staggering; 82% of middle schoolers in a 2016 study were unable to tell the difference between an online ad and a news article. Even more frightening is that 59% of adults in a 2014 study couldn’t tell the difference either. 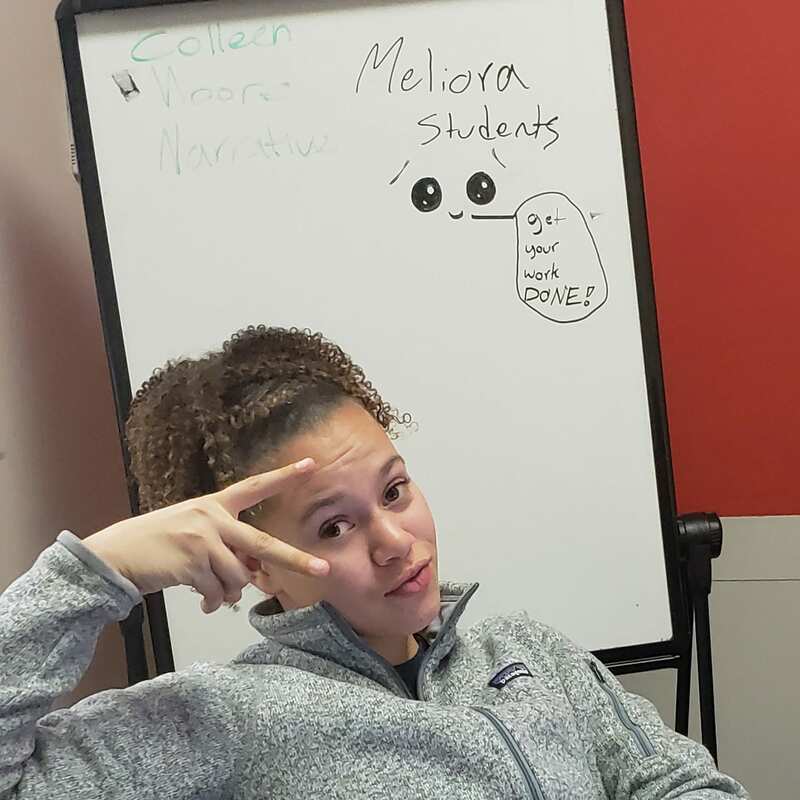 As Sam Wineburg, Stanford University professor states, “rather than teaching them [history lessons] as rules or things fixed in time or set in amber, these are precisely the kinds of things that are worthy of debate.” In Meliora history classes, every topic is open to discussion. I impress upon my students that I am not the “expert,” that they are welcome to challenge any claim I make… as long as they have evidence. As we ask our students “why?” and “how do you know?” during these kinds of discussions, we are helping them develop their #criticalthinking skills. For the curious, the Meliora documentary project currently in competition can be viewed here. I have an admission to make. I am living vicariously through my #Meliora students. A group of five teens has been crafting a documentary project for Chicago History Fair, with the goal of advancing the several steps that will take them to National History Day. This competition asks students in grades 6-12 to convincingly argue a thesis, a skill many students develop only in college. The Meliora team’s self-chosen topic (a central #PBL tenet is to give students #voice and #choice in deciding what topics they #deepdive into) shines a spotlight on Colleen Moore, a larger-than-life, yet nearly-forgotten woman who was a top salary-earner in silent films; a significant influence on the evolution of American society’s views of women through her “safe” flapper lifestyle; and an investor maven, unheard of in her time. Through a fortuitous series of events, the students located Moore’s grandson. I urged them to ask him for an interview, the goal being to have him provide them with additional evidence to include in their project. His initial reply to their email request was pretty abrupt, with edges of ice. He pointed them to a variety of existing sources that detail her life and influence, and said he would need to understand their “line of questioning” before granting an interview. After receiving their list of questions, he agreed to a telephone interview, which was conducted by three of the five team members. When they actually got on the phone with him, he was friendly and forthcoming with information, and provided very intimate views of Colleen Moore from his viewpoint as her grandson. It was apparent during the interview that the three student interviewers were feeling nervous. Notwithstanding, they did a stellar job, and obtained the information they were seeking. After they concluded the call, their relief was palpable, followed by laughter, and “That was great!’ They felt exhilaration related to the fact that this hard task they had never tried before had been a success. This. Is. What. We. Want: Students. To. Learn. #RealWorld. #Skills. The students’ project has advanced to the next level of competition), and they are currently in the process of improving it, based on judge feedback, readying themselves for the next level of competition. This iterative approach is integrated into #RealWorld design processes, another way #PBL helps prepare students for the adult world. A few moments after the agonizingly drawn-out note-writing experience I describe here, I witnessed (not for the first time!) the mercurial shift of these teens into almost-adults. Each year, the history students in my #Meliora project-based learning (#PBL) practice create a project to submit to the National History Day (NHD) competition. This year, a group of five students is collaborating on creating a video documentary. The deadline to submit their work for the first round of competitions is eight days away. They have a lot of work to do, as is the case every year about this time, when students realize they are down to the wire. This afternoon, I sat in on a revision process of the voice-over narrative the students are going to use. The objective of the narrative is to argue their thesis. The quality of their thesis and supporting evidence is what will allow them to advance to the next level of competition. Or not. One student started reading the narrative, and was having difficulty staying focused enough to read smoothly. Another student stepped in to take over the task. The “hand-off” was done with a friendly, positive attitude by both students. Students were listening intently to the narrative flow. When students heard something they felt was lacking/incomplete/repetitive, they spoke up immediately and the whole group worked to find a solution. There was no defensive or argumentative behavior and they came to consensus efficiently. Intellectual challenge and accomplishment. At the beginning of the semester, they spent weeks researching and defining their thesis. Once established, my persistent question to them has been “how does this narrative support your thesis?” That was a question they returned to throughout their review today. Authenticity. They had complete choice over their topic, the two constraints being that it relate to Illinois history and that it fit the NHD theme, which this year is “Triumph & Tragedy in History.” This is a requirement of the Chicago History Fair organization, the regional level of entry into National History Fair. Due to this freedom of choice, they have remained highly engaged in conducting research and creating a convincing argument. Public product. The students will be presenting their work to a panel of judges in a public forum, which raises the stakes and their desire to create a high-quality product. The stakes (the intensity of competition) will continue to raise as they advance levels. Collaboration. Today’s task was completely collaborative. Throughout the project, they have worked both individually and collaboratively toward a common objective, which is persuasively arguing their thesis. Project management. They students have been using Trello throughout the project process to identify, assign, and track progress on tasks. Finalizing the narrative is a task they must complete before they can assemble the video documentary, so they understand the criticality. Reflection. They were actively and openly reflecting on the narrative composition that had been done to-date. Throughout the project development process, they are required to reflect on how the items they are researching, the books, images, video clips, newspaper articles, etc. contribute to their argument. They assigned team roles and responsibilities early in the project, and have continued to modify them over time, based on the interests and skills of each team member. I have every confidence a week from now these engaged, enthusiastic students will have a well-argued, well-edited documentary to submit for competition. Because they care.